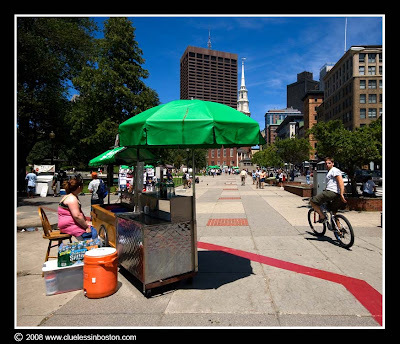 Sidewalk vendor and bicyclist on Tremont Street. Nice shot! Love the composition and the lines of the pavement taking my attention into the distance! Tremont street looks a great deal shinier than I remember it. Looks like summer in bean town!! The little boy looking back at you is the perfect moment. The whole secne just draws you in. I love this shot- it's pure city life!